US Naval F6F Hellcats began attacking Taiwan on Oct 12, 1944. The bombing continued into 1945. On May 31, 1945, Governor General Ando Rikichi's Office in Taipei was bombed and part of the building destroyed [the building was later repaired and became the Presidential Palace after 1949]. These bombings had caused an untold number of civilian casualties, totally forgotten to this day. The intended target might have been the train station (top), the actual area bombed was clearly residential (bottom). 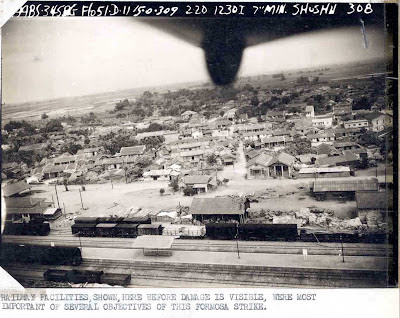 "On March 1, 1945: SOUTHWEST PACIFIC AREA [SWPA, Far East Air Force (FEAF)]: In Formosa, B-24s bomb the Takao aluminum plant, Tainan Airfield and nearby satellite field and fighters hit buildings at Keishu and storage tanks, railroad yards, and targets of opportunity." Tainan Airfield was the main intended target. It was the "targets of opportunity" that had caused immense damage to the downtown area. The fire burned for three days. And "事後統計,那天被炸燒毀的建物多達一五二○戶,死亡九十人,傷者一四六人." - up to 1,520 buildings were destroyed with 90 dead and 146 wounded. In this case, it was a large-scale fire-bombing which might have been directed at the headquarters of the 2nd United Infantry Division (the garrison army of Taiwan); instead, most bombs ended up in the commercial district. US Airmen were allowed to use on-the-spot judgment in picking targets. In many instances, pilots of the low-flying F6Fs and B-24s made eye contact with civilians on the ground (even smiling at each other as one elderly Taiwanese recalls). In the heat of the battle, some pilots might have gotten carried away and attacked anything that looked suspicious. However, some civilians were killed while running for cover and even more died inside bomb shelters that were deliberately hit. These were malicious acts. Although, to be fair to the US aircrew on the raids pictured, these do seem to be attacks on legitimate military targets - a strike on shipping and an attack on camoflaged materiel protected by a revetment. 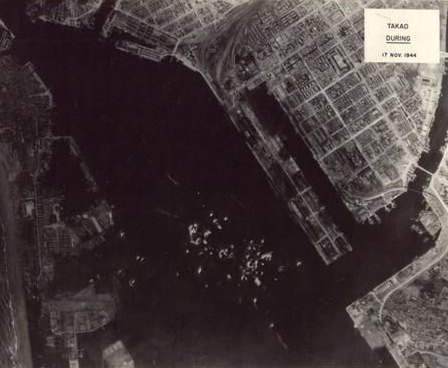 Certainly civilian casualties may have resulted from these strikes despite the military nature of their targets, but this was an inevitable feature of the war that Japan unleashed on the rest of the world, dragging Taiwan along with it. Unfortunately, not only military targets were hit. 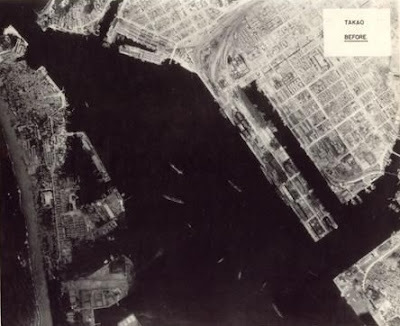 In Tamsui, for example, the 13 US F6Fs, after attacking the oil storage tanks and the seaplane base, they strafed and bombed the now Chung Cheng Road and Chung-Jian Street residential areas, resulting in the death of 20 civilians. This was not an isolated incident, either. It occurred all over the island. Those pictures only told part of the story, from the US side. Most older Taiwanese still remember the horror in the months that followed the first raid on 10/12/1944. Their stories will be told in a documentary. Stay tuned. Straffing of civilian road transport was, unfortunately, standard policy - not only in the Far East but also in the war against Germany. There was debate as to whether these explicit orders to target all road transport may have consituted a war crime, but, as with 'area bombing' in Germany and Japan, it was not to be considered so. There is also the question as to whether this constituted a double standard when Germans and Japanese were tried, and in some cases executed, for massacres of civilians. At the very least I think this one can be dismissed - no Germans or Japanese were tried for area bombing or strafing of civilian transport. What they were tried for is for actions intended not to bring the end of the war closer, or the accidental targetting of civilians, but for intentional acts directed solely to the aim of enslaving and exterminating whole countries. In the battle of Manila, for example, whilst the US army may have killed many civilians in an effort to liberate the city through the use of heavy weapons, they did not indulge in the wholesale massacre of civilians during the battle that the Imperial Japanese forces did. The US army did not intend to kill civilians, but the Japanese forces did and acted on this intent. Of course, I do have a personal interest in this as my grandfather was a member of RAF Bomber Command. "Railway facilities shown here before damage is visible, were most important of several objectives of this Formosa raid"
And photo very clearly shows a railway martialling yard - a valid target, although unfortunately located near a residential area. In the second photo, whilst there is no description, the target appears to have been the road bridge pictured - again, an arguably legitimate target even if it is close to residential area. The Tainan raid descibed specifies military and strategic targets. Whilst these may have missed their targets and hit a commerical area, this does not show that they intended to hit a residential area. 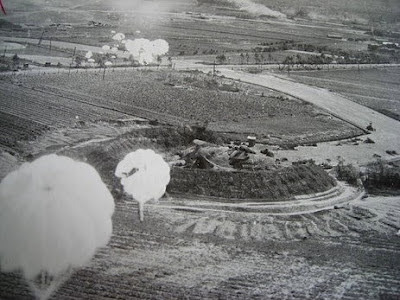 Whilst it is undeniably true that individual pilots may have attacked civilian targets as ttargets of opportunity (not least because they describe, e.g., straffing bullock-drawn-carts and the like) these phots are not evidence of intentional attacks on residential areas in Taiwan. Yes, the top photo shows the train station, obviously the intended target; the bottom one, however, shows an area way beyond it (you can use the small lake on the left as the landmark) and a direct hit of some farm houses. The loss of lives is now recorded in the ChoShu Township history, thanks to the effort of one of its native sons. His grandmother still recalls seeing human body parts hanging from the trees, BTW. 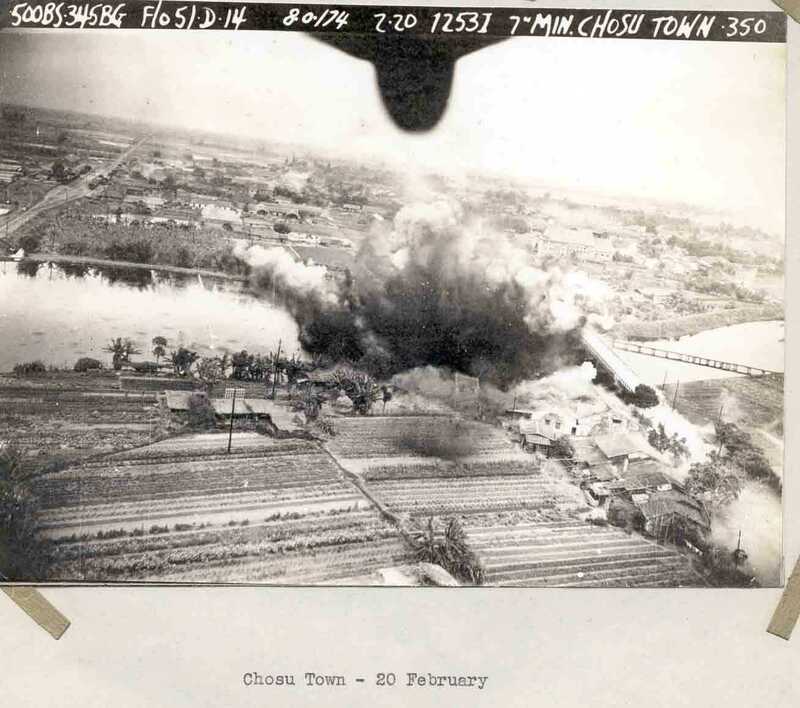 One of the US pilots who bombed ChoShu, when contacted had no recollection of the raid. Although he did wish that he did not cause much grief of the folks in ChoShu. Which we understand. Bombing of Taiwan was not like the fire bombing of Dresden or Tokyo. And it was not done with laser-guided precision bombs of today. We do take the losses as collateral damages, never regard the US airmen as war criminals. Some of them could very well be, though. I did not know you were a Brit with a personal interest to boot. You may know the long history of the British presence in my hometown Tamsui. They usually went back home to the UK and never to be heard from again [John Dodd comes to mind]. Hope you'll come back and visit Taiwan again. Agreed on all points, including the hope that I'll come back to Taiwan one day. After a year living in Taiwan back in 2001-2, and a couple working for Foxconn in 2006-7, I haven't been back to Taiwan since I spent a couple of months there in 2009, but it remains my favourite place on earth. I've lived in Nanjing, Shenzhen, London, Tokyo, Osaka, and (now) Wroclaw in Poland, but nowhere has quite the mix of beautiful countryside, brilliant weather, excellent cuisine, and undoubted friendliness that you find in Taiwan. Long overdue, another visit to Taiwan, that is. Do let us know when you come back. We'll share a few 台啤s at the very least. "US Airmen were allowed to use on-the-spot judgment in picking targets. In many instances, pilots of the low-flying F6Fs and B-24s made eye contact with civilians on the ground (even smiling at each other as one elderly Taiwanese recalls)." 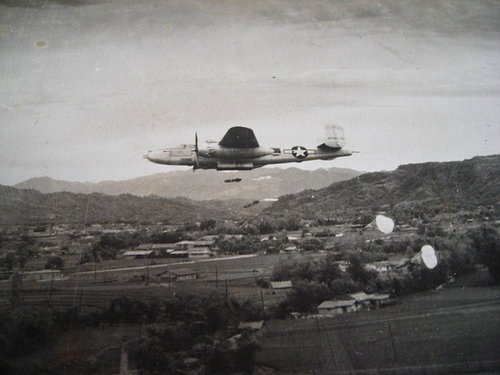 My grandpa, who flew with the Jolly Rogers "outfit" of the Fifth Airforce, was supposed to bomb Taoyuan on July 9, 1945. They gave up because of cloud cover; they couldn't make a visual of the ground. They were flying back to Mindoro, their base in the Philippines, when the sky suddenly cleared. 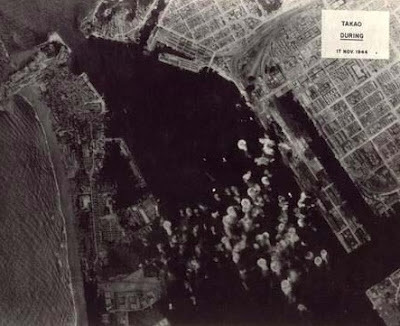 They bombed the airport at Gongshan, near Kaohsiung instead. "Our sixth mission on Friday, July 13, was to Canton, China. This was a bad day. Our previous day the Jolly Rogers had bombed this area and had reported flak too heavy for comfort. In fact, one ship was hit and couldn't make it back, but landed in China and the crew was picked up by Chinese guerillas. We were flying lead. It was cloudy, but we could see the ground enough to bomb. Well, we got confused about a bridge in the river and dropped our bombs on the wrong target and wiped out a Chinese settlement. I felt pretty bad about that, especially after I had seen the pictures taken of the bomb hit. We got a hole on the end of our left wing, and another on top of the plane. Just about every ship got hit that day." July 9, 1945? Then I would not have been at the receiving end of your grandfather's bombs. In Nov, 1944, my mother carried me on her back and traveled from Tamsui to visit my father then waiting in Zuo-ying to be shipped out. We ran into a US bombing raid of Kaohsiung, only to be helped by a gentleman to safety. My mother regretted all her life for not having the presence of mind and asked for this kind gentleman's name. Ms BH Hong pointed out to me that he was apparently an angel sent to save us. This I now agree. "July 9, 1945? Then I would not have been at the receiving end of your grandfather's bombs." I am so happy that what you say is the truth. "Then I would not have been at the receiving end of your grandfather's bombs. In Nov, 1944, my mother carried me on her back and traveled from Tamsui to visit my father then waiting in Zuo-ying to be shipped out." No, he never bombed northern Taiwan. He originally left Hawaii on May 1, 1945, at 10:45 a.m., for Canton. "At first Canton seemed like a wonderful place. I went swimming at 7:30 and it was the most enjoyable swim I ever had. I swam in a big lagoon that had been dug out right next to the shore. It was about 80 feet wide. Near the shore it was shallow, just as calm as a lake, and just the right temperature . . .
As the days wore on, Canton Island began to get a little monotonous. The daily fishing and fish fries became less exciting, and I began to tire of lobster, fried tuna, baracuda, and other fish. Since we had no duties, it was difficult to fill in all the hours reading, playing cards, and talking to the same fellows all the time...."
Then on to Los Negros. Then Nadzab, New Guinea. Then Biak. Moratai. Zamboaga. Tacloan. Mindoro. There was a mission to Balikpapan, Borneo. "We got orders to bomb this one target fifteen days in a row as the Australians were getting ready to invade. This was a cinch as there was no flak, except for one instance. The navy way just off shore and if the Japs started using anti-aircraft guns, the navy would shell their positions with ease. I'll always be thankful to the navy for that. Balikpapan the previous summer would have been a rough target, but it had been well softened up for us. After 15 days of bombing by our planes, the place was a wreck. Smoke from the oil wells was as high as our planes, and we were flying around 10,000 feet. We generally flew six planes to a squadron. The Jolly Rogers consisted of four squadrons so there were 24 planes from this group on most missions." He continues: "The missions to Borneo were extremely long [much longer than I am guessing to Taiwan], most time averaging 13 hours in the air." He flies another mission to Borneo. "It was after this mission that Burgi, the crazy gunner, and Hall, the engineer, gave up. Four missions were all they could take." So maybe Taiwan was mission five, because it was the fifth. The sixth was to Canton(?). My grandpa made 14 missions. He never returned to Formosa. I need to re-read this. Thanks a lot for providing more of your grandfather's story. I was initially puzzled by the mention of Canton. It now appears that it was an island in the Pacific, not the province of the same name in China. I was struck by your grandfather's participation in the battle of Balikpapan (July 1-21, 1945). Of the 18 physicians (out of 59) who had survived the sinking of Shinsei Maru on Jan 12, 1945, only one, Dr Chen Der-huan, made it to Balikpapan, the intended final destination [see: http://shinseimaru.blogspot.com/2012/04/blog-post.html]. The residual battles continued after July 21. He and another Japanese were forced to retreat to Sandakan, and surrendered on the spot on Aug 17, 1945. He survived the POW camp in Surabaya, and returned to Taiwan in June, 1946. For the rest of his life, he served as a country doc in Hsin-chu. Dr Chen passed away in 2001 at age 90. "The missions to Borneo were extremely long" - it was a 玉碎 "fight to the death" as far as the Japanese were concerned. "Thanks a lot for providing more of your grandfather's story." My pleasure; hopefully, it's useful in piecing the account together more completely. "It now appears that it was an island in the Pacific, not the province of the same name in China." It never occurred to me, but that makes sense: Kanton. This'll be a great addition to the storyline of "the Pacific War and Tamsui" documentary. Thanks a lot. I took a look my best guess is that the bomb hit Yongding road on Feb 20, 1945. The bridges seem to match and a slight change in the English translation name.